Trillions of neutrinos, or ghost particles, are passing through us every second. While scientists know this fact, they don�t know what role neutrinos play in the universe because they are immensely difficult to measure. New measurements of neutrino oscillations, observed at the IceCube Neutrino Observatory at the South Pole, have shed light on outstanding questions regarding fundamental properties of neutrinos. These new measurements of neutrinos as they change from one type to another while they travel were presented at the American Physical Society Meeting in Seattle, Washington. They could help fill key gaps in the Standard Model, the theory that describes the behavior of fundamental particles at every energy scale scientists have been able to measure. "While the Standard Model is an accurate theory, it leaves gaping holes, like the nature of dark matter and how a universe filled with matter, rather than anti-matter, arose from the Big Bang. We don�t know how to fill them yet," said Tyce DeYoung, an associate professor of physics and astronomy at Michigan State University. "We�re hoping that by measuring the properties of neutrinos, such as their masses and how they morph or oscillate from one into another, we may get some clues into these open questions." Energetic neutrinos produced by cosmic rays hitting the Earth�s atmosphere can be detected at the South Pole using the Antarctic ice as a particle detector like no other on the planet. "Neutrinos have a habit of changing, or oscillating, between three types; we call them 'flavors,'" said Joshua Hignight, a research associate at MSU. "So, if one neutrino is a precisely equal mix of two flavors, it could be a surprising coincidence or there might be a deeper reason for it coming from the physics beyond the Standard Model." These measurements are consistent with results from other experiments using neutrinos with lower energies, but whether this flavor mixture is exactly balanced remains under debate. 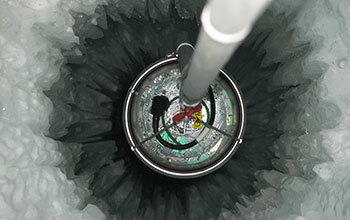 The IceCube physicists will continue to refine their analysis and collect more data. Future data will enable these measurements to be made more precisely, DeYoung said. IceCube -- the world�s largest neutrino detector -- uses a billion tons of the Antarctic ice cap beneath the U.S. Amundsen-Scott South Pole Station to observe neutrinos. It�s operated by a collaboration of 300 physicists from 48 universities and national laboratories in 12 countries. Construction was made possible by support from the National Science Foundation and other international funding agencies.